The U.S. Patent and Trademark Office on Tuesday granted Apple's patent for an iPhone gaming accessory that extends in-game controls beyond the handset's display and onto D-pads or joysticks, saving precious screen real estate in the process. Apple's U.S. Patent No. 8,939,838 for an "Accessory for playing games with a portable electronic device," was filed for over six years ago, just after the iPhone 3G was announced, and describes a piece of gaming hardware designed exclusively for use with a handset or portable media player, like the iPod. Also mentioned among the invention's many hardware variations is an external thumb keyboard device. According to the document, Apple recognized the iPhone's untapped gaming potential, the surface of which was just being scratched when the patent was filed with the introduction of the App Store and third-party titles like FieldRunners, GTS World Racing and Rolando. Most first- and second-generation games took advantage of the iPhone's multitouch screen, but Apple notes onscreen control methods often disrupt a player's view. 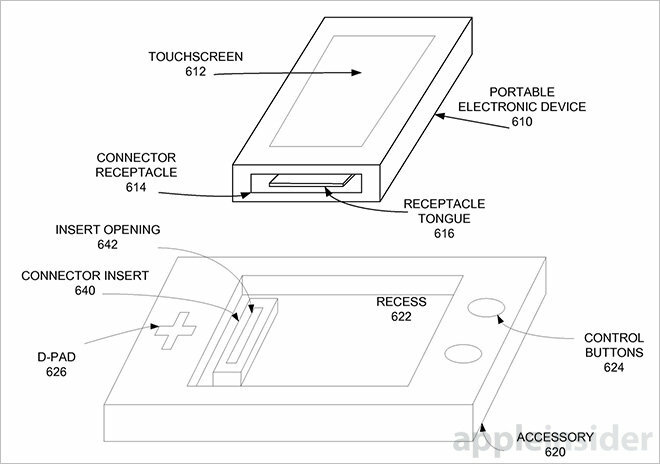 To solve this newfound problem, Apple's patent details an add-on device with directional pads, joysticks, action buttons and more. All important controls are positioned around a central recess that serves as a dock for a user's iPhone —positioned in either landscape or portrait orientation —which slides, snaps or otherwise locks itself in place. Certain embodiments hold conditions for extras like cameras, microphones, speakers and in one example, a Nintendo DS-like secondary multitouch display. Apple suggests a second handset can be used for the latter. When inserted into the gaming pad, the iPhone essentially becomes part of a larger portable system complete with multiple D-pads or joysticks, full-function action buttons, "rumble" feedback and other niceties. 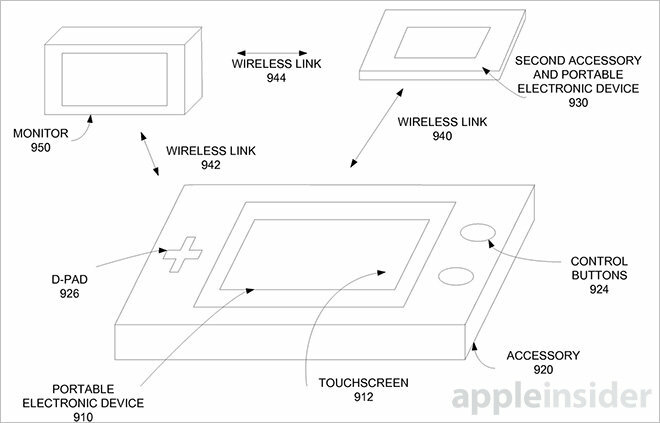 Apple points out that the controller may not require a hardwired connection and can instead communicate with an iPhone wirelessly, eliminating the need for bulky connectors. The patent also provides for wireless multiplayer gaming with other players using similar accessory hardware. 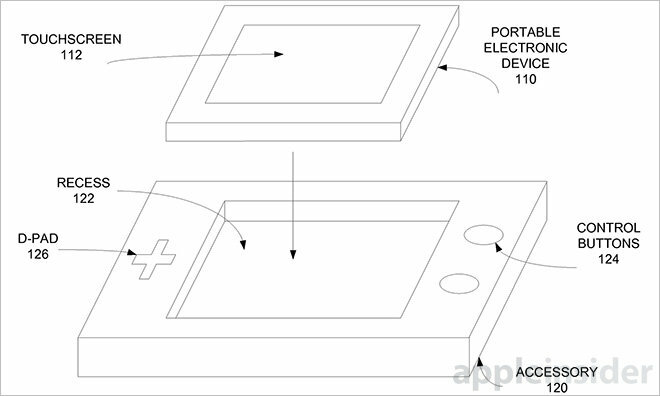 Like many portable gaming consoles, Apple's proposed setup would include point-to-point or ad-hoc connectivity established using Wi-Fi or Bluetooth, as well as capabilities for gaming online. In some embodiments, the gaming device contains onboard storage for offloading game files and profiles, meaning Apple designed the device to be multi-user friendly. Interestingly, another implementation of the invention outlines a snap-on attachment with physical thumb keyboard, much like the Typo Bluetooth keyboard introduced in 2014. 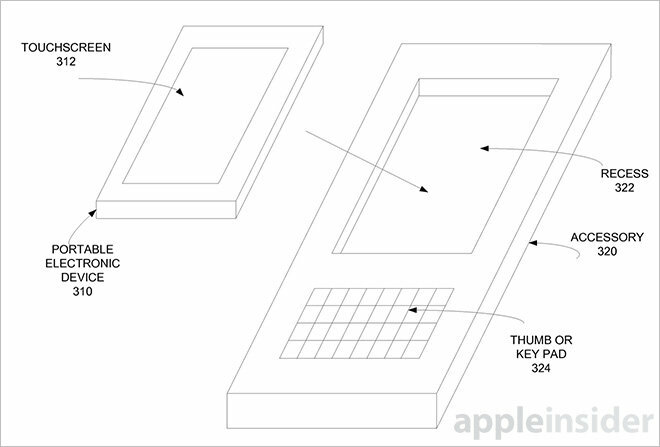 In the patent, Apple points out that the iPhone's soft keyboard eats up a large portion of screen real estate, though that problem has been somewhat nullified as the handset's display size has increased over the years. Finally, the device may be capable of streaming gameplay onto an external monitor, a technology already built into current versions of AirPlay and supported by various third-party apps. Since Apple first applied for its gaming accessory patent, a number of aftermarket manufacturers have stepped in with nearly identical designs, including the Moga Ace gaming controller and its newer sibling, the Moga Rebel. Apple's iPhone gaming accessory patent was first filed for in 2008 and credits Brett Gregory Alten and Sanjay Sadanand Gadkari as its inventors.